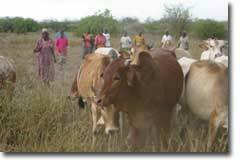 Rehabilitation of Arid Environments (RAE) was registered in Kenya as a Charitable Trust on 18 November, 1993. RAE was established "for the relief of poverty and distress of the residents of Kenya through rehabilitation and improvement of arid and semi-arid areas and the establishment of sustainable land management practices of those areas" (RAE Trust Declaration). RAE has been established for charitable and educational purposes, which, as defined by U.S. statutes, includes "relief of poor and distressed or of the underprivileged" and "instruction of the public on subjects useful to the individual and beneficial to the community,". As RAE satisfies the organisational and operational requirements set forth in Treas. Reg. Secs. 1.501(c)(3)-1(b) and (c), the Trust has been qualified by the Ford Foundation as a 501(c)(3) foreign equivalent. Although RAE is not registered as a charitable organisation in another country besides Kenya, tax deductible contributions can be made to RAE through its umbrella organisation in Michigan, USA. For more information about making tax deductible donations contact Deborah Padgett at the U.S. Inc. address below. Most funding received by RAE is earmarked for particular projects and time durations. Many donors, such as Ford Foundation, have funded RAE for a number of years, approving new grants on the successful completion of previous grants. RAE submits detailed proposals and budgets for specific projects to funding organisations. Once approved, donors evaluate and assess progress through regular reports and field visits. Audited accounts of RAE expenditure are submitted on a regular basis for review and approval by donor accountants. RAE has received funding from various donors over the years including, amongst others: the United Nations Development Programme (UNDP); Drylands Development Centre (DDC/UNDP), International Development Research Center (IDRC), African Wildlife Foundation (AWF), Rockefeller Foundation, Ford Foundation, Danish International Development Assistance (DANIDA), and Commonwealth Science Council. Smaller donations have also been received by the Trust for particular activities, such as the RAE Clinic. Contributions have been received from Bancker-Williams Foundation, Stryker-Short Foundation and individuals. On an even smaller scale, but equally important, the Baringo people contribute in both kind and cash to activities initiated by the RAE Trust.